These seven cards were sent by Korora of Akron, Ohio, which has put the home of The 'Zips on the map. 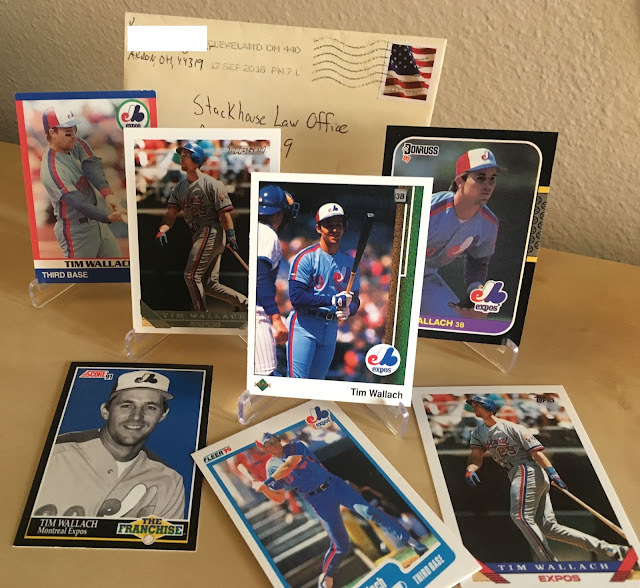 The 1991 Score Superstar is a somewhat unusual card to see, but a trend I'm keeping an eye on is 1989 Upper Deck. Back in say 1991, the I had more copies of the 1989 Upper Deck card than any other Wallach card in my collection. Today I have fewer than 200 copies, which isn't by any means a small number, but it is noticeably smaller number than what I have for other junk wax sets from the era. I had so many of them at the time because every card shop in Phoenix was busting at the seems with 1989 UD. Yet today, people seem to be sitting on it. I expect it will level out eventually and I'll end up with as many copies of '89 UD as say '90 Fleer, but for now, it's lagging behind. Thank you for the cards Korora.